I can't pass up anything that is made to resemble the perfect taste combination that is a s'more. These s'more whoopie pies look like a fun treat, but now that the weather is warm I think I might use Shelly's graham cracker whoopie pie recipe and that yummy chocolate layer, but replace the marshmallow center with some toasted marshmallow flavored ice cream. Now the only problem is finding a toasted marshmallow ice cream recipe. I have a toasted marshmallow shake recipe that we love and I will have to find a way to use the ingredients to make some homemade ice cream. I will keep you posted. 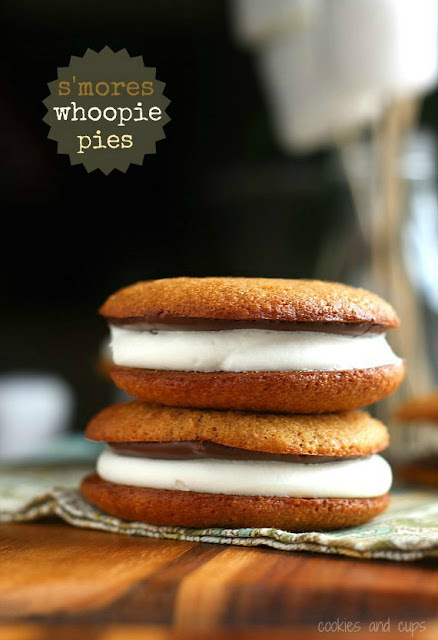 You can check out these yummy s'mores whoopie pies over at Cookies and Cups.